Add a feel of understated refinement and style to your entertainment bar or kitchen counter with the Bradley Stool. Designed with a clean line design, the straightforward silhouette of metal legs are enough to evoke a sense of contemporary styling. This beautiful modern piece will look great in your dining setting. 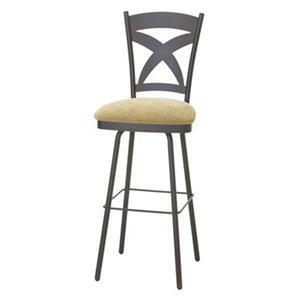 The Urban 30" Bar Height Bradley Stool by Amisco at Dinette Depot in the Brookfield, Danbury, Newington, Hartford, Connecticut area. Product availability may vary. Contact us for the most current availability on this product. The Urban collection is a great option if you are looking for Contemporary furniture in the Brookfield, Danbury, Newington, Hartford, Connecticut area.